SG-6 returns from P2X-885 with word that the planet has fallen to the Ori. Dakara, too, has been visited by the Priors. Gerak has embraced their teachings, proposing that Origin be adopted by the Jaffa as law, and Teal'c and Bra'tac travel to Chulak to seek support against Gerak's proposal. Meanwhile, Carter believes that research from Khalek may hold the key to developing a device that could neutralize the Priors' powers. However, when a member of SG-6 falls ill, and others with whom he had been in contact exhibit similar symptoms, it becomes apparent that a Prior plague has already begun to spread on Earth. As Carter works to develop a means to combat the Priors, a familiar presence appears. It is Orlin, who has taken human form as a young boy in order to retain the knowledge of the Ancients as long as possible to offer assistance in defeating the Ori. Orlin warns that the Ori draw their power from those who relinquish their will to worship them. No longer an Ancient, he has no healing power to cure the plague, but he believes that a medical solution can be found using a sample of blood from the Prior who caused the plague. Time is running out, however. With thousands of confirmed cases, the plague is out of control. The prototype of Carter's anti-Prior device may provide an opportunity to collect a blood sample. The Prior is expected to return to the Sodan world, and Mitchell takes a team to P9G-844. Meanwhile, Gerak confronts his adversaries on Chulak, but he cannot bring himself to fire upon his brother Jaffa. His weakness angers the Prior, who allows Gerak's mind to travel to Celestis where he is brought before the Flames of Enlightenment. Teal'c seizes the opportunity to address the Council at Dakara, but he is interrupted by Gerak's return. Gerak has been transformed into a Prior, and he boldly declares that it is the destiny of all Jaffa to follow Origin. As a Prior of the Ori, Gerak hopes to use his powers to convert the Jaffa to Origin, but Teal'c and Bra'tac prepare to force his hand by gathering a fleet at Chulak and forcing him to choose between the Ori and his own brethren. Among the Sodan, Mitchell and Daniel gain the support of Haikon and his people. They have seen the evil of the Ori for themselves and they vow to cooperate with SG-1's plan to test the new anti-Prior device and to capture a Prior alive. Meanwhile, on Earth, Orlin and Carter struggle to find a cure for the Prior plague, but the weight of Orlin's Ancient knowledge has taken its toll, and his mind is irreversibly failing. 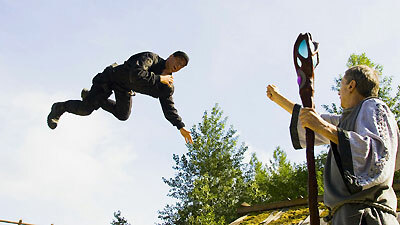 The Prior returns to the Sodan village, and uses his powers against Mitchell and the defiant warriors as Daniel desperately struggles to activate the anti-Prior device. When at last his powers are neutralized, SG-1 obtains a blood sample and attempts to turn him against his gods. He remains unmoved, however, even when Orlin arrives to confront him with the truth, that Origin does not lead to enlightenment or ascension. Spouting parables, prophecies, and rhetoric, the Prior begins to regain his powers, but he falls instead to Mitchell's weapon, and Orlin explains the meaning of his words. The Ori are coming to this galaxy to destroy the Ancients. The plague on Earth has become a global pandemic, and Landry is among those who have fallen ill at the SGC. Meanwhile, with their fleets in orbit above Chulak, Gerak and Teal'c meet face to face on the planet in an effort to avoid more bloodshed. As Gerak begins to waver in his devotion, he agrees to come with Teal'c to Earth. There he plants his Prior staff, and a wave of light penetrates every corner of the SGC as Gerak vanishes in flames. The patients are miraculously cured, and using Orlin's research, a vaccine can be synthesized against future plagues. However, their victory is only a minor setback to the Ori's ultimate goal. This episode aired in two parts. A long time ago, the Ori and the Alterans were one society, human, on an evolutionary path to ascension, but a philosophical division grew. The Ori grew more and more fervent in their religious belief. The Alterans believed in science. The Ori tried to wipe them out, but instead of going to war, the Alterans built a ship, left their galaxy, and came to Earth. Both the Alterans and the Ori eventually ascended, and the Ori passed down a religion called Origin to the next evolution of humans they created. There is a real, physical transfer of energy to the Ori that occurs simply through a human being's belief in them. For it to have a measurable effect, it requires massive numbers of humans relinquishing their will. The knowledge of the Ancients is too massive for a normal human brain to handle. A younger brain gave Orlin a slightly better chance of retaining the knowledge a little longer since the neural make-up of a still-developing mind has the potential for better memory retention than that of an adult. Ultimately he will lose most of the knowledge and will not be able to ascend again. P2X-885 has fallen to the Ori, the third planet this month. Gerak became a Prior and vowed to spread the word of the Ori to all Jaffa. Hammond is wearing a civilian suit rather than a uniform. At the Battle of Tazek'Sur on Chulak, Gerak's father had been killed in the rebellion against the Goa'uld. The International Committee is referred to as the IOA (International Oversight Advisory). When over 8000 people had been infected by the Prior plague in 13 states, the President ordered all US borders closed and put the country entirely under quarantine. The Prior plague spread to US, Mexico, Canada, Paris, Bonn, Amsterdam, Rome, Madrid, London, Athens, and Africa. The final death toll of the pandemic was estimated at a little over 3,000 worldwide.